Addlestone & Staines Taekwon-do welcome all ages and abilities to learn the exciting martial art of Taekwon-do in a friendly environment. Chief Instructor Master Alan Liu has years of experience as both an instructor and competitor and can provide expert teaching on aspects of fitness, stretching, sparring and patterns. With over 16 years of teaching Taekwon-do in Middlesex and Surrey, 100's of students have trained at Addlestone & Staines TKD. Many of our students go on to achieve Black Belt status, become qualified instructors, compete and win medals in numerous national and international Taekwon-do tournaments. Total Kids Defence! 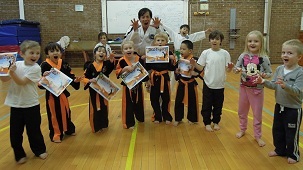 Tigers is a life-skills class for children between 3 and 6 years old. Self-discipline, focus & awareness! 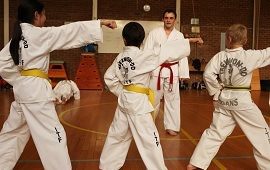 TKD Kids is for children between 7 and 12 years old. Fitness, flexibility and technique! TKD Adults is for ages 13+. Learn one of the most powerful and effective martial arts.